Now I am sure that you have heard of the old expression ‘Opposites attract’, right? If so, then I am sure that you have also heard of the expression ‘Wagga-wagga ning-nong bugga-biggi-boooo’. Huh? No? You haven’t? Well these chaps have – Director: Arthur Hiller; and Actors: Bette Midler, Shelley Long, and George Carlin – especially in 1987 and for 100 minutes. Every time prim and proper wannabe actress, Lauren Ames (Shelley Long), bumps into urbane performer, Sandy Brozinsky (Bette Midler), she just pisses her off. When Lauren and Sandy first meet before enrolling into in an acting class – she pisses her off. Whilst Lauren and Sandy perform in said acting class together – she pisses her off. And ultimately, when Lauren and Sandy discover that they are going out with the same man, Michael Sanders (Peter Coyote), after he dies in a bomb explosion – well – you can safely say that they are none to pleased. However, when both of these women meet up in the morgue to identify Frank’s dead body, straight away they figure out that Frank is not dead at all – but rather, alive. So what do they do about this? Fight? Err – yes. But also, these women form a pact of sorts, and use their feminine wiles, their acting abilities, and a shed load of cash that they steal from a couple of drug-dealers, to follow Franks trail from a tobacconists, to a taxi-depot, then a drug-den, and eventually an airport – resulting in the knowledge that Frank has fled to Albuquerque. Unfortunately, though, when Sandy and Lauren both get to Albuquerque and find Frank, a number of things are revealed to them, that turn there world upside down. As the elusive Frank reveals his true nature – the CIA reveal why they have been following them for all this time – and the KGB reveal why Frank befriended them to begin with. Now you must have heard the old adage about a woman being scorned, right? So what do you think that both Sandy and Lauren do next, to show Frank how they feel about him? Correct – they try to track him down for the last time, with a little help from a drunken tracker, Frank Madras (George Carlin). Though, do you think that they manage to accomplish this task? Err – in a matter of sorts – at a brothel. Still, what then transpires is a rather brisk and bold affair indeed – as hostages are taken – ploys are played – Indians attack – and finally, friendships are formed. I first saw ‘Outrageous Fortune’ whilst I was growing up as a kid, and I have to admit, that I did not understand it at all. I remember scratching my head and wondering why that skinny blond lady from ‘Cheers’, and that scary looking Jewish woman whom my Mother loved listening to on the radio, were both running all over the place for a man who looked liked my wood-work teacher. Well, it just did not make sense to me – I did not see the motivation as to why they went to all that trouble, just to find some shaggy haired git who could screw a nut into a socket. However, now that I am of a slightly more mature age (don’t laugh), and that I have seen this film from a more adult perspective (I said don’t laugh), this fact bothers me still – NOT! OK, kidding aside, on this viewing my perspective did change quite a bit about this film, because – in essence – I can see it for what it truly is – a chick flick sprinkled with some eighties charm. For a start, it is an adventure story. Then, you can say that it is a parable about how ‘opposites do attract’. But ultimately, it is a film that does not take itself too seriously, and is just a fun and delightful tale about two miss matched women looking for love, and find friendship instead. Truthfully, there were many scenes in ‘Outrageous Fortune’ that made me laugh out loud for many different reasons. Firstly, I liked the chemistry between Shelly and Bette – as their incremental relationship was very believable at times. Secondly, I would have to say that some of the one-liners where really sharp and... err... outrageous – though not as PC as some people may like. Thirdly, I did find some of the situations that ‘the girls’ got themselves into, rather jovial and adventurous in tone – even if somewhat contrived. And finally, I have to say that this is not a bad film to watch if you want a laugh – and I do mean laugh. Now to juxtapose this stance, I feel that this eighties chick flick did falter in a number of places. Granted, the jovial pretext is not at fault here, but rather the way that the middle section of the film appeared to drag on in places, and that the end sequence seemed to go on for just too long. Fair enough, these sections where propped up with the exocentric efforts of comedian, George Carlin. Nevertheless, as George has stated about himself in the past, his acting ability in this film was not up to his standards on stage. 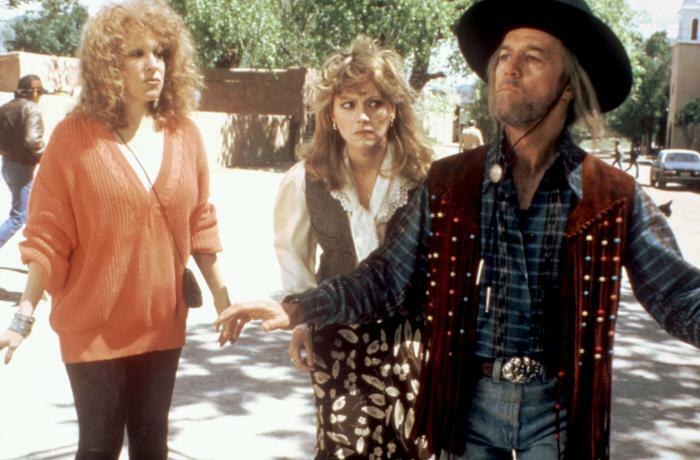 Overall, though, ‘Outrageous Fortune’ is a good film to watch if you want to see what women used to be like back in the day - when they had sass, big hair, and shoulder pads to match. Moreover, if you want to see two great women run about and shout at each other, just because they want to shag my word-work teacher.